Move oven rack to lowest position. Heat oven to 425°F. Lightly grease side only of 9-inch springform pan with shortening. In small bowl, mix graham cracker crumbs, margarine and 2 tablespoons sugar; press evenly on bottom of pan. In large bowl, beat cream cheese, 1 3/4 cups sugar, the flour, orange peel, lemon peel and salt with electric mixer on medium speed about 1 minute or until smooth. Beat in egg product and egg yolks, beating on low speed until well blended. Pour over graham cracker mixture. Without releasing or removing side of pan, run metal spatula along side of cheesecake to loosen. Refrigerate uncovered about 3 hours or until chilled; cover and continue refrigerating at least 9 hours but no longer than 48 hours. Run metal spatula along side of cheesecake to loosen again. 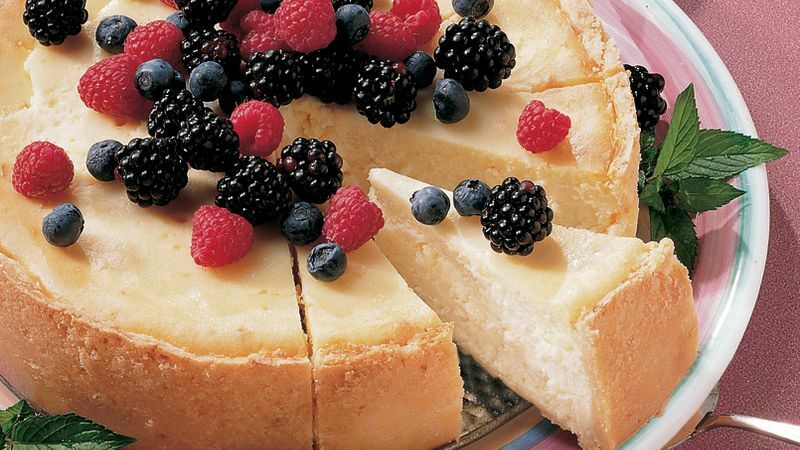 Remove side of pan; leave cheesecake on pan bottom to serve. Serve with berries, if desired. Store covered in refrigerator. The Neufchâtel found in most grocery stores is a lower-fat version of regular cream cheese, but true Neufchâtel is a soft, white, unripened cheese native to the Normandy region of France. Planning to make your own graham cracker crumbs? You’ll need about 10 cracker squares to get the 3/4 cup of crumbs called for here. If you want to make a big batch to have on hand for other desserts, freeze crumbs in a self-sealing freezer bag.